Are you looking for the best handwriting or note taking apps for your iPad Pro, iPad and iPhone? 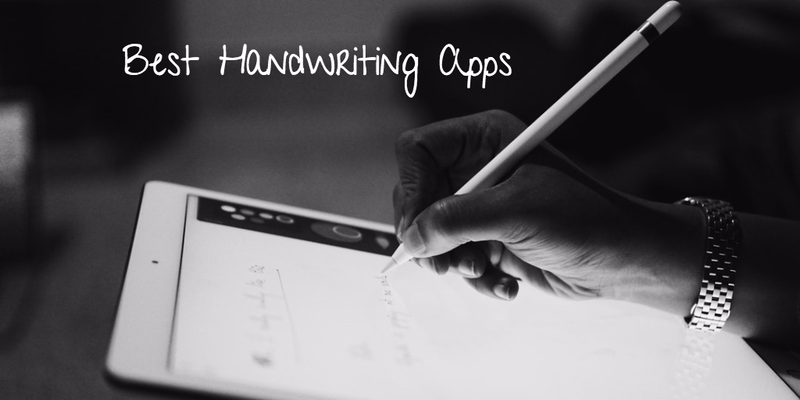 You are the right place, here you can see 9 best and awesome handwriting apps. These apps have different abilities and advantages such as- converting your handwriting to a typed letter with proper integration and more. With the help of these best handwriting apps, you can write effortlessly and quickly on your iPad Pro, iPad and iPhone. 1. 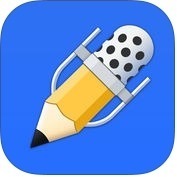 Notability ( iPhone + iPad ) :- Notability is one of the best and powerful note-taking, handwriting and PDF annotation app for iPhone and iPad. With the help of Notability app, you can create a paperless classroom, you can keep yourself organized across devices and platforms, you can drag and drop to move files, text, photos, GIFs, web pages, and more from other apps, while editing a note you can view other files in the files app at the same time, you can write and sketch with beautiful ink, you can write smoothly and quickly with zoom-writing and with the help of Apple Pencil and iPad Pro giving you the most responsive, you can draw perfectly straight lines for graphs, designs and shapes, you can import PDF, DOC, PPT, image files and GIFs from other apps into the library or into notes, you can import or take pictures of relevant information to annotate, you can audio recordings, review and give feedback, you can watch your notes animate along with the recording, you can organize and, share notes through email, AirDrop, Google Drive, Dropbox, Twitter, OneDrive and more. 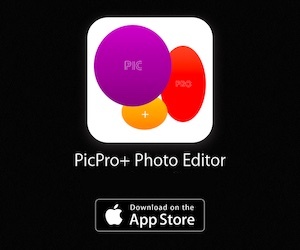 iCloud automatically syncs your notes to this app on iPad, iPhone and Mac. 2. 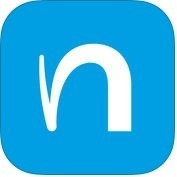 Noteshelf ( iPad ) :- This is a beautiful handwritten notes and annotate PDFs app for iPad users. With the help of Noteshelf app, you can type your notes, record audio, draw shapes, sketch ideas, sign contracts, fill forms, print documents and, you can choose from a selection of 70 tastefully designed notebook covers, you can create as many notebooks as you like for various purposes such as meeting notes, journals, sketches, project works and class notes, you can easily organize pages inside and across notebooks, you can add a passcode to protect important and sensitive notes, you can record lectures, meetings and discussions while taking notes, you can add photos to your notes, artworks, recipes, diaries and more, you can send your notes to Dropbox, Evernote, Google Drive for archival or sharing with classmates, colleagues or clients and, you can do much more. 3. 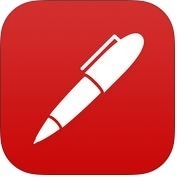 Notes Plus ( iPhone + iPad ) :- With the help of Notes Plus app, you can convert handwriting to text with the support of Apple Pencil and iPad Pro. 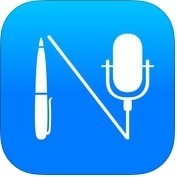 Notes Plus app has lots of powerful and unique features such as type text, background audio recording, supports more than 50 languages, automatic shape detection, inserting images from photos or directly from the camera, importing PDF and DOC files to annotate, exporting notes like PDF or images to Dropbox, Google Drive, Evernote, and other apps, automatic backup to Dropbox, multi-level folder management and, much more. 4. mazec – Handwriting input method ( iPhone + iPad ) :- mazec is one of the most advanced and user-friendly handwriting apps for iPhone and iPad users. With the help of mazec app, you can write an email, make a social post or quickly jot your notes, you can convert handwriting to text. mazec app has several unique and user-interface features such as auto and manual learning dictionary, emoji input, handwriting input available to all apps on the device, handwriting emails and social posts quick and, fun and saves your time, quickly fill out web forms and important documents online, multiple languages and, much more. 5. 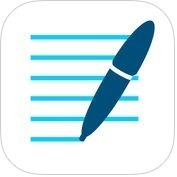 GoodNotes 4 ( iPhone + iPad ) :- GoodNotes is one of the best and beautiful handwriting notes and annotate PDF apps for iPhone and iPad users. With the help of GoodNotes app, you can type with the keyboard, insert images or draw perfect shapes easily anytime, anywhere, you can mix between any kind of papers or even insert PDF documents inside a notebook, you can rearrange or delete pages as you like, you can save your time and paper, you can add your own template with an image or a PDF file, you can write quickly with your fingers, you can correct any mistake any time, you can protect your valuable data and, you can also backup your data to Dropbox, Google Drive, Box and SkyDrive automatically. 6. 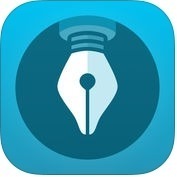 MetaMoJi Note - note taking and PDF annotation app ( iPhone + iPad ) :- MetaMoJi is one of the best, full-featured and perfect handwriting apps for iPhone and iPad. With the help of MetaMoJi Note app, you can write, sketch or draw notes with a variety of pens, paper layouts and graphics, you can grab your great ideas quickly with voice memos, you can import images, graphics and Microsoft Office files through Google Drive, you can also import a PDF file and save it as another PDF file, you can share your creations by email or upload to Twitter, Facebook or Tumblr, you can save drawings as individual JPEG graphics in the items library for later use, you can protect your notes with password and, you can also highlighted with advanced pen, fountain pens and brushes. 7. 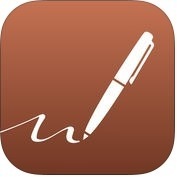 Penultimate ( iPad ) :- It is one of the best and powerful digital handwriting apps for iPad. 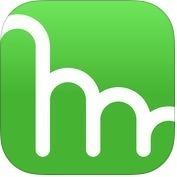 It combines distraction-free, natural handwriting and sketching with the power of Evernote's sync and search. With the help of Penultimate app, you can choose from a number of paper styles, or import an image to create personalized paper and, you can also save and browse your work in notebooks and insert, delete, duplicate and reorganize pages any way you like. 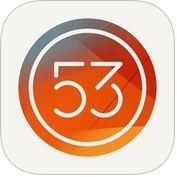 Penultimate app has several unique features such as ink and paper made better, stylus and software built together, your writing keeps pace with you, connect and sync with evernote, find what you need quickly and, much more. 8. Paper by FiftyThree - Sketch, Diagram, Take Notes ( iPhone + iPad ) :- With the help of Paper by Fifty Three app, you can connect your notes, photos & sketches, you can create checklists, spotlight details in photos and sketch diagrams with unbeatable speed and easily, you can keep your ideas organized, and see everything in one place and, you can do much more. 9. MyScript Nebo ( iPad ) :- If you want to write, draw, edit and format your notes quickly, you can use MyScript Nebo app on your iPad. With the help of MyScript Nebo app, you can add interactive diagrams, editable equations, freeform sketches, and annotate pictures, convert your captured ink to a digital typeset document on demand, edit and format with your Apple Pencil, export as text, PDF, HTML or Word and, decide where to take your writing next, search and find handwritten ink and text in your note, including in your diagrams, you can organize your notes in pages, notebooks and folders and, you can also sync your notes to Dropbox.